Future Shock: The Big Heist by David Baillie, Dan Lester and Daniel Dwyer. It’s tempting to become complacent about 2000AD. In a way, it’s draining keeping up with a weekly comic, keeping track of multiple narrative threads, keeping the attention of an impatient audience. This week, I find myself thinking a lot about how the team have gone about this. For starters, the cover. Instead of offering us a glimpse of what’s within, we get a rare portrait of the mighty Tharg himself with the marvellous tagline “90% inspiration, 10% threat of obliteration”, flanked by a particularly sinister looking Mek-Quake. It’s interesting because it bears no relevance to the contents – which is itself a statement of confidence in the product. It could be argued that it’s exclusive, as it’s unclear how this would necessarily draw in the reader – instead, it’s a gamble. I would have to say, though that it’s not that successful – Alex Thomon’s digital art, whilst theoretically fitting, jars somewhat. 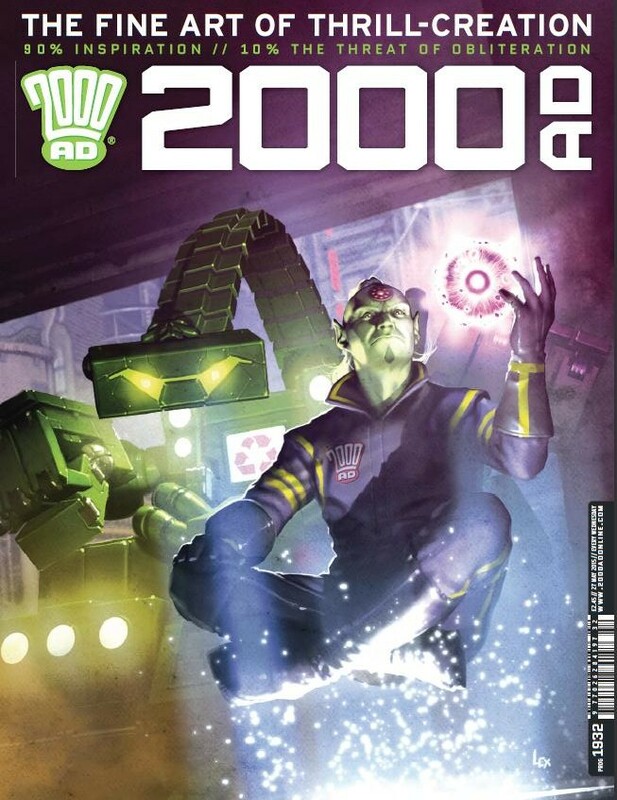 But with not one but two short-form stories, in the absence of Dan Abnett’s Grey Area (btw, somebody give that man a TV contract and then kindly take all my money), and with work from the Thought Bubble portfolio winner Daniel Dwyer, 2000AD is proudly showing its roots with this week’s prog. So, the tale of one man pushed to the limit, a common theme of Dredd, takes a surprising twist when rather than being an alien artefact as the McGuffin, as expected, instead it’s from an unspecified point in the Megaverse’s future. This is an interesting counterpoint to Dredd’s investigation, as we have a glimpse of how justice may be meted out beyond the regular timeframe. It’s interesting in terms of its speculation but I feel it’s drifting away from the nuanced social commentary that Dredd needs to keep relevant. Still enjoyable, but needs a meatier resolution, and adding another element to the narrative dilutes it somewhat. Somehow, from Wagner of all people, I expect more. I’ve talked at length how Mills has drawn out an extended tale; his pacing is explicitly epic, fitting the dark age warlord saga entirely appropriately. Here, we finally see Sláine not only bring further ruin upon his pursuers but draw his daughter out of her drug laced, brainwashed fugue. It’s highly effective insofar as his does this whilst simultaneously bringing back a former comrade and turncoat; the reader can see the potential, the threat that the Drunelords pose to Sláine but also that there is the possibility of redemption. It’s tempting to see Sláine as lacking depth and as an excuse for beautifully-painted ultraviolence, but Mills is exploring profound questions about belief, friendship and love through his thoroughly modern interpretation of a classical form. A potent piece of writing that demands a lot of the reader but continues to reward in full. There’s a long running tradition of one-shot and short form stories in 2000AD, which really make the best of the format. In this middle section of a 3-part tale (although little is lost if you missed the first part, enjoyable as it was), what happens when an ad break in the middle of Father Ted starts to invade our world? A wonderful, whimsical, Outer Limits style tale with a side-order of prawn crackers and bizarre sparkly space Lego. As a lifelong 2000AD fan, the Thought Bubble portfolio competition always struck me as a great way for folk to show their talent, appreciation and inspiration. Dwyer’s efforts, attached to this classic-style Future Shock, doesn’t in any way disappoint. It could easily fall down many contrived narrative traps, and instead is all about the characters and their motivations: we all know, after all, how a heist will ultimately go down, so it’s who, not the how, that interests us. In the end, it’s got a tremendously satisfying payoff (pun not just intended but required) and Dwyer’s retro art is extremely impressive. A Future Shock straight out of the 80s, in all the right ways. Wagner loves to reel his audience in, and in this story he’s managed to expertly tread the conventions of cowboy and cold-war spy, wrapped up in an excellent sci-fi package. It’s so impressive to see the bluff and counter-bluff written by a master, and offset with the Ezquerra art that seems so effortless this remains a fine conclusion to the issue. Wagner delivers a masterclass in short-form storytelling: it’s still, at Part 9, completely accessible to the newcomer. I find my rating for 2000AD doesn’t change much, even though individual issues, and stories, vary enormously. Why is this? Because, for all its ups and downs, it’s still the galaxy’s greatest comic.